I just broadcast live from INSIDE Facebook 3D Spaces: it was like teleporting to the future. 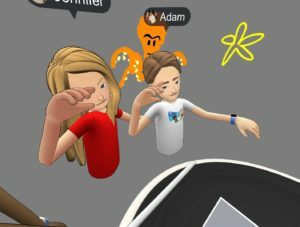 I just broadcast LIVE from inside Facebook’s just revealed 3D Spaces feature, and it was much cooler than I ever expected. 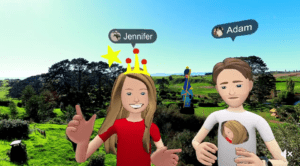 Facebook just launched ‘3D Posts,’ which lets you play with VR objects in Facebook News Feed and bring it into your own virtual reality space. It’s the first step in being able to exchange objects, ideas, scenes, photos, and experiences across virtual spaces. If if you don’t have a VR headset, you can interact with it like a 360 video, just by clicking on it in your own Facebook feed. 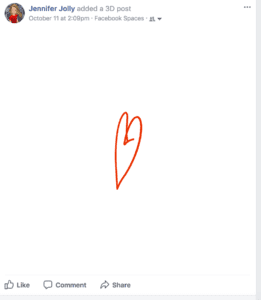 Go to my Facebook feed to see several examples — like the heart, and happy face. Now – who cares about this? The most obvious answer for now, is gamers and early adopters. As many as four people at once can be sharing space inside a virtual world. My new buddies Adam and Joshua took me ice fishing. With the help of touch controllers, I actually “felt” fish nibbling at the bait, then the pole pending, and the fish fighting as I reeled in a big ole’ lunker. 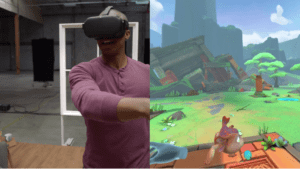 Beyond gaming though, VR collaboration in 3D Spaces offers a really interesting new immersive work space for artists, designers, architects, scientists, doctors, educators, and all kinds of other creative endeavors. 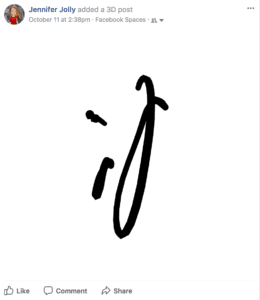 At it’s most basic though, it’s pretty fun to draw and sketch and share notes like Happy Birthday. Bottomline, it people another way to interact with each other, create, and play with something you’ve made. The most fun I had was “dabbing” and taking selfies with Adam and Joshua. The strangest part was that I played around with the Oculus Rift in 3D Spaces for more than two hours straight. Typically, I burn out on VR within an hour or so, and it used to make me feel really motion sick. I wanted to spend more time than ever with it, and it felt much more realistic than ever. The other big takeaways from this year’s annual Oculus Connect: the VR hardware is getting a lot better – and less expensive. Facebook showed off a new $199 standalone Oculus Go VR headset. Facebook CEO Mark Zuckerberg said Oculus Go finds “that sweet spot” of an affordable price and a high-end virtual reality experience. Current VR experiences fall into two categories: smartphone-enabled headsets carrying a lower price tag but a jumpier experience, and PC experiences that are higher quality, but cost more and are usually tethered to the computer. The Oculus Go ships in 2018. Developers will receive test kits next month. It will use apps and games that are available on both Samsung’s Gear VR, which uses Oculus technology, and the high-end Oculus Rift. The device also includes spatial audio integrated into the headset, which means no need to wear headphones. It also features a “breathable” mesh fabric and custom optical design, said Hugo Barra, head of VR at Facebook. Facebook also announced a drop in price for its high-end Oculus Rift headset to $399, the third price cut since its launch. I also went hands-on with a separate standalone VR prototype, Project Santa Cruz, which is supposed to be a more sophisticated version of Go, but includes sleek built-in headphones the ability to track the position of controllers in your hands. While the headset didn’t fit my face as well as the upgraded Rift headsets, it was great not to be tethered to anything, and the experiences were much more immersive and interactive than anything I’ve experienced before. You can see the entire 23 minute video I made from Oculus Connect here and watch all kinds of other Oculus produced video here.